Monsieur Jean Clieze, an official of the province of Québec’s Ministère des Marches Ridicules, and a notorious flâneur, steps into Spring. In Montreal, we are well known for our joie de flâner, and for our smartly turned out flâneurs. You begin to notice them in spring, when the red buds of the silver maple begin to bloom. They appear as solitary walkers, dapper in a grey fedora, or sporting a wine-dark silk scarf, or carrying an umbrella with a wooden handle carved in the shape of a loon. You also see them lounging purposefully in cafés, sipping espresso and perusing The New York Times, Le Monde, and Tuck Magazine. These emblematic archetypes of modern experience, these strolling urban explorers and philosopher-aesthetes – whose representatives past and present include Leonard Cohen, Pierre Trudeau, Guy Laliberté, Louise Lecavalier, and Xavier Dolan – have come to define a city rich in mystery, paradox, and contradiction, sort of like the rest of the world. Leonard Cohen, at 80 years old still Montreal’s coolest suit-wearing devotee of Zen, in September 2014 perpetrated his thirteenth studio album Popular Problems. The critics loved it. It reached No. 1 in 29 countries on the iTunes chart and the Top 5 in an additional 15 countries. Cohen accomplished this senescent feat after releasing two live and one studio album in quick succession, all of them critically acclaimed (in December 2014 he released a third live album). His marathon 2008-2010 and 2012-2013 world tours have been like those evangelical events that fervent crowds throng in stadiums around the globe. Not a bad final act for a “cult” artist and victim of a manager who ripped him off for his entire live savings of five million dollars, who he then forgave. Flâneur sans pareil. Pierre Trudeau, without doubt the most glamorously cosmopolitan of Canada’s Prime Ministers, will likely haunt the collective memory of Canadians for as long as the country exists. A diamond-hardheaded intellectual who could also lead, he did what no Canadian politician before or since has done: he got people excited about politics and public affairs. Sometimes he even made people dream. However you judge his accomplishments, he outmanoeuvered his political adversaries with immensely stylish and consistent skill and, in doing so, unified a fractious country. One of the many images from Trudeau’s cabinet of curious flâneuring: Exhibition Stadium, Toronto, Nov. 28, 1970. It was one month after the October Crisis, during which the Front de libération du Québec kidnapped British trade commissioner James Cross and kidnapped and murdered Quebec labour minister Pierre Laporte. In order to prevent a perceived insurrection, Trudeau had invoked the controversial War Measures Act. When asked by an anxious reporter what he would do next, the uttered the famous words: “Just watch me.” Now at Exhibition Stadium just weeks later, the Prime Minister, in full Oscar Wilde mode – jaunty wide-brimmed fedora, rakish black cape, red lapel rose of course, and mischievous smile – descends the grandstand steps to present the Grey Cup trophy to the victorious Montreal Alouettes. 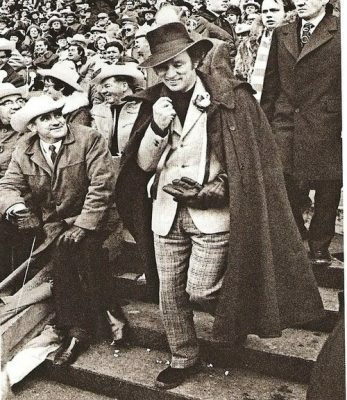 Cowboy-hatted, practical-coated fans of the Calgary Stampeders phalanx the grandstand’s seatage, amused, and perhaps impressed, by the man’s audacious self-possession and singular style. Trudeau embodied the Italian concept of sprezzatura, translated variously as “effortless mastery,” “spontaneous nonchalance,” and “the art of making the difficult look easy.” I watched him once, gliding as if on ice towards his favourite sushi restaurant not far from Cormier House, his historic Art Deco home in downtown Montreal. The “just watch me” flâneur. Guy Laliberté: the man whose combustible passion developed a fire-breathing, stilt-walking busking operation into the largest theatrical production company in the world. The annual billion-dollar earnings of the creative and commercial juggernaut that is Cirque du Soleil equal all the money annually made on Broadway. With its hugely imaginative synthesis of circus styles from around the world, its story- and character-driven modus operandi, and absence of performing animals, Cirque du Soleil has transformed the once declining and decaying circus genre into a thing of ever evolving glory. The Cirque signature: multitudes of fantastic creatures defying gravity and convention; living works of art stealing fire from the gods; dazzlements of perpetual acrobatics, contemplative stillness, twisted dream-like contortions, and pagan mythologies of disintegration and renewal. From Mystére to Zumanity, from Ovo to a new arena show based on James Cameron’s Avatar, Laliberté has written the New Testament of entertainment and won the respect of the world. 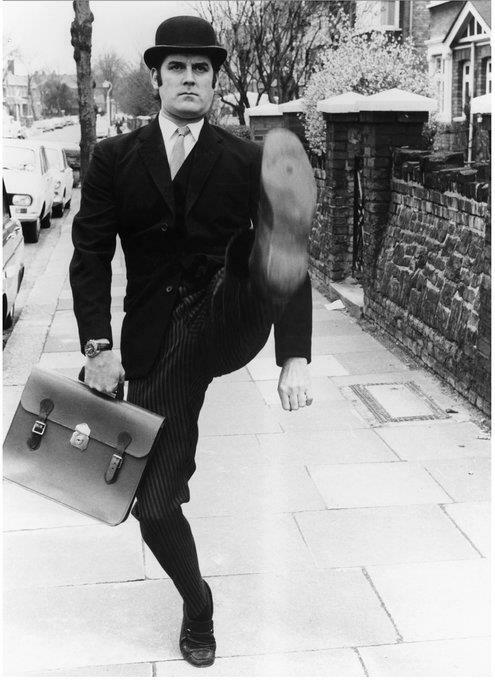 The recipient of too many awards and honours to list here, including Time magazine’s “100 most influential people in the world,” the man is far too busy to do much practical flâneuring most days. But he remains a flâneur among flâneurs. Louise Lecavalier, “the most tragically brilliant dancer alive today” (Melody Maker, London), defines a Montreal-inflected devotion to the ancient, holy sacrament of dance. Her 19-year tenure as the angelically ferocious star of one of the most exciting and innovative modern dance companies in the world, Montreal’s La La La Human Steps; her collaborations with David Bowie, Frank Zappa, and Kevin Shields, some of which inhabit YouTube like purgatorial fever dreams; have forged her into an iconic figure within a permanently subversive Montreal dance tradition. The gobsmacking signature move for which she’ll always be remembered: the full-body barrel jump, a sort of horizonal pirouette, that seems impossible, but there it is. Her high-flying ventures continue to cram the sagging shelves of a small aircraft hangar with domestic and international honours and awards. In 2014 she received Canada’s highest honour in the performing arts: the Governor General’s Award for Lifetime Artistic Achievement in dance. Working independently since 2006, Lecavalier has choreographed, partnered, and danced with herself and others in her contemporary dance company, the Montreal-based Fou Glorieux. Her work is an ecstatic exploration of fear, desire, truth, passion, pain, and love. A flâneuse given birth to by Apollo and Dionysus, gods of form and chaos. And now the Fifth Element of our representative quincunx of Montreal’s flâneurs, the 25-year-old prodigy Xavier Dolan. Mommy, Dolan’s fifth film, displays a nascent sophistication that cracks open magic doors that may yet fling wide in Quebec and Canadian cinema. At the 2014 Cannes Film Festival, Mommy received a 13-minute standing ovation and shared the Prix du Jury with Jean-Luc Godard. This elegant and disturbing film – featuring the coruscating acting genius of Anne Dorval, Antoine-Olivier Pilon, and Suzanne Clément – tells the story of a working-class widow who suffers through the agony of raising her troubled and sometimes violent son. But on another level, it’s about the crooked timber of all our merely human lives: the mortal flaws, and the immutable forces, that will always thwart our desire to overcome our limitations. Salvation arrives only when we choose to reconcile ourselves to what the Gnostics called the kenoma, the cosmic emptiness in which we all wander and weep. Xavier Dolan: even his name has something of the flâneur about it. This representative quincunx of Montreal’s flâneurs reminds us to step up and out fully into the moment, to be curious and fearless, to embrace the unknown and to choose happiness. As the snow melts and the sun warms the red buds of the silver maple, and their surrealistic, capillary-like bloodflowers burst into existence, let us become connoisseurs of all the beauty and pleasure that life offers us, including the free and perfect bliss of the art de flâner.